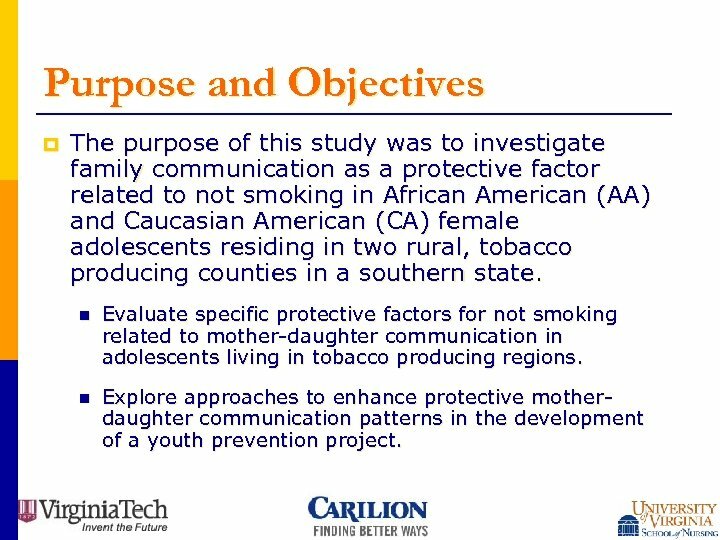 Purpose and Objectives p The purpose of this study was to investigate family communication as a protective factor related to not smoking in African American (AA) and Caucasian American (CA) female adolescents residing in two rural, tobacco producing counties in a southern state. 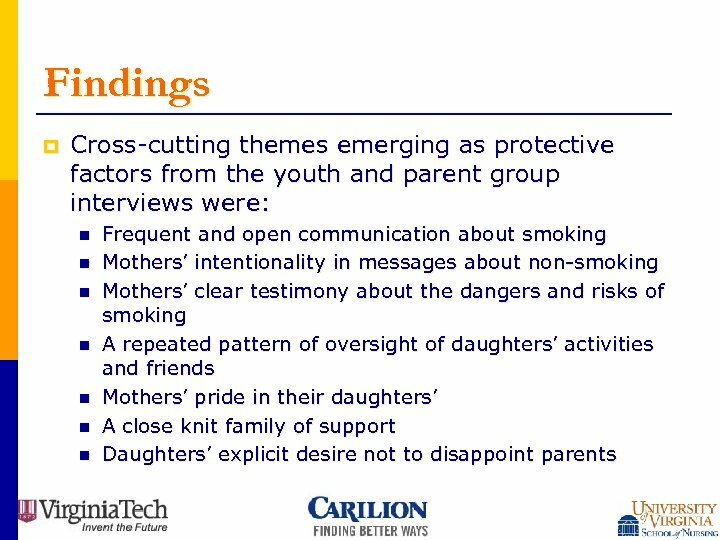 n Evaluate specific protective factors for not smoking related to mother-daughter communication in adolescents living in tobacco producing regions. 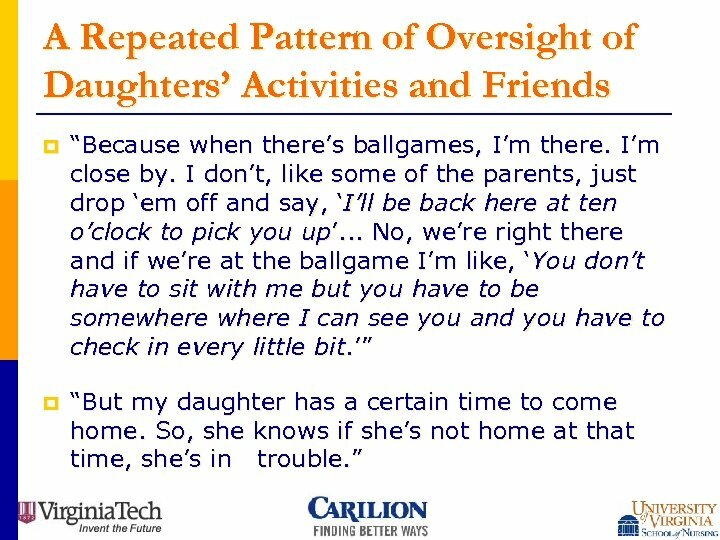 n Explore approaches to enhance protective motherdaughter communication patterns in the development of a youth prevention project. Methods p Data were collected using a semi-structured protocol and group interview method. 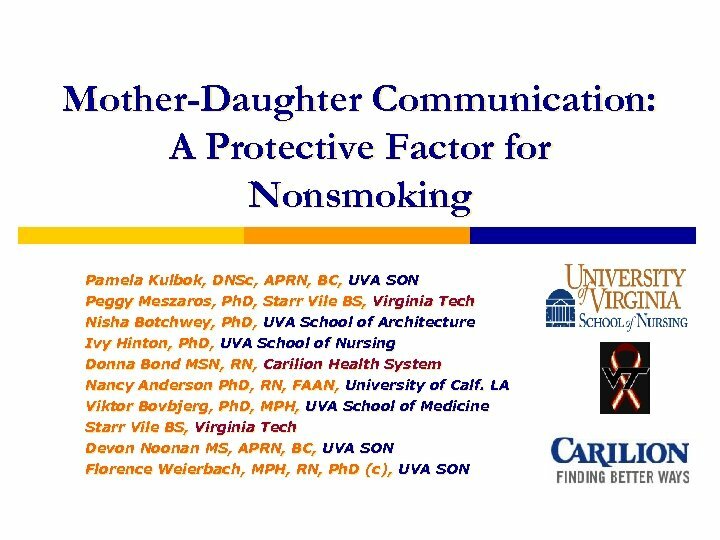 p Interviews were conducted with four separate groups of AA and CA female adolescents who never tried or had experimented with smoking and AA and CA mothers. p Interviews were tape-recorded and transcribed. 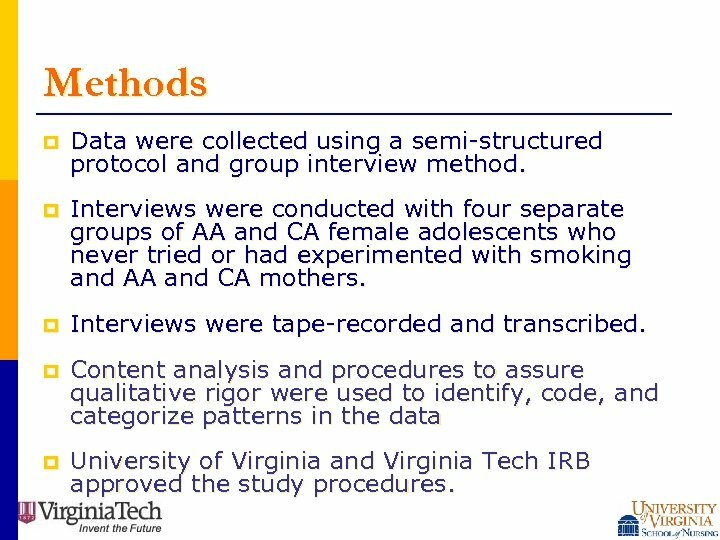 p Content analysis and procedures to assure qualitative rigor were used to identify, code, and categorize patterns in the data p University of Virginia and Virginia Tech IRB approved the study procedures. 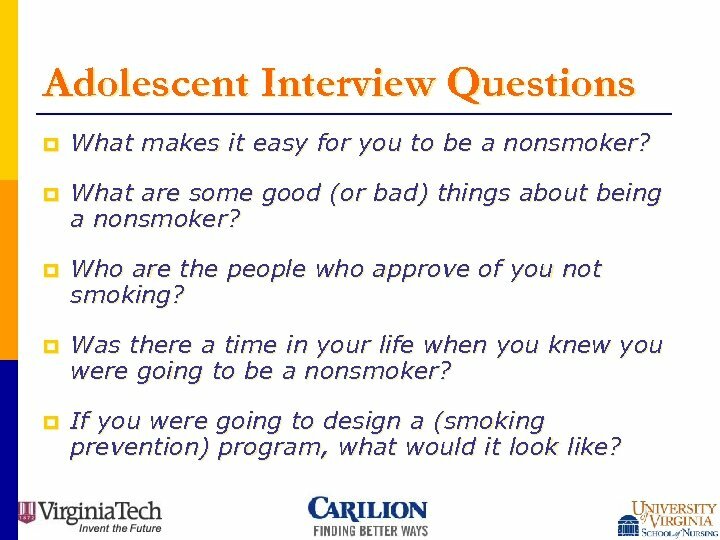 Adolescent Interview Questions p What makes it easy for you to be a nonsmoker? 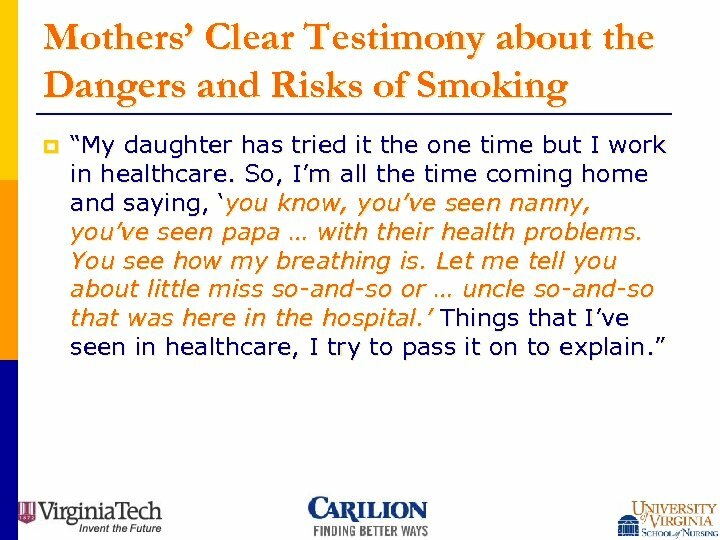 p What are some good (or bad) things about being a nonsmoker? p Who are the people who approve of you not smoking? p Was there a time in your life when you knew you were going to be a nonsmoker? 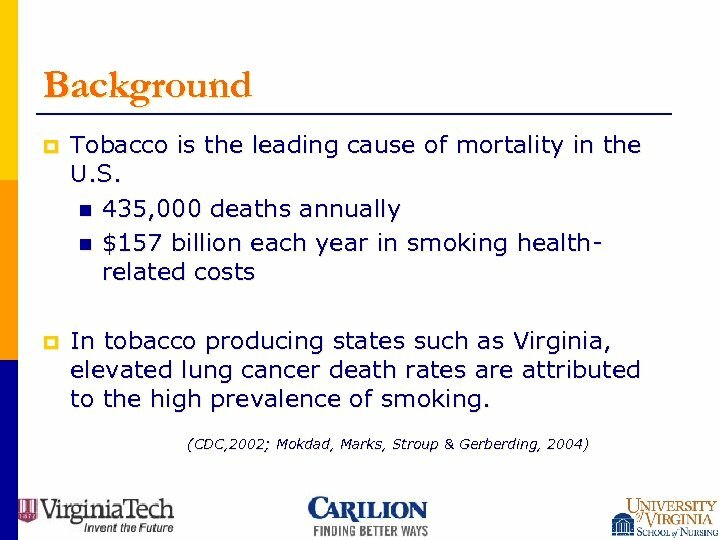 p If you were going to design a (smoking prevention) program, what would it look like? 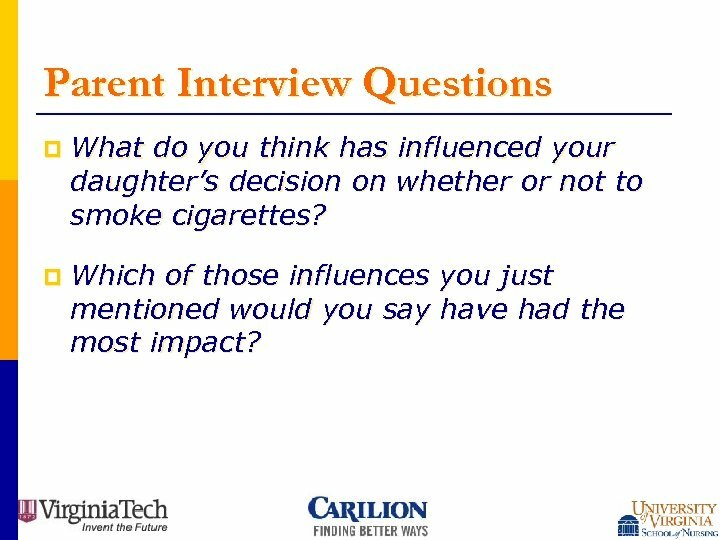 Parent Interview Questions p What do you think has influenced your daughter’s decision on whether or not to smoke cigarettes? p Which of those influences you just mentioned would you say have had the most impact? 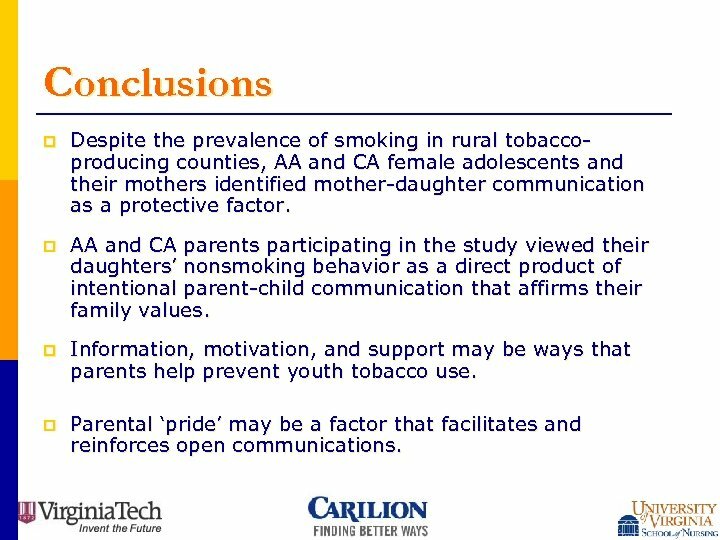 Conclusions p Despite the prevalence of smoking in rural tobaccoproducing counties, AA and CA female adolescents and their mothers identified mother-daughter communication as a protective factor. 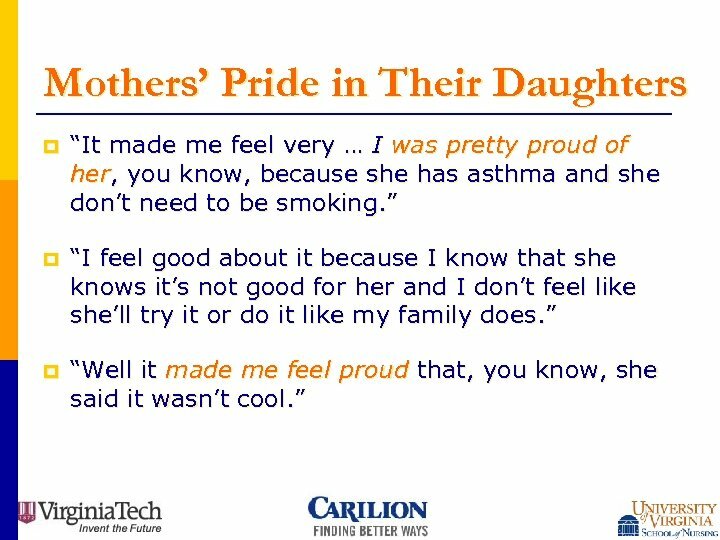 p AA and CA parents participating in the study viewed their daughters’ nonsmoking behavior as a direct product of intentional parent-child communication that affirms their family values. 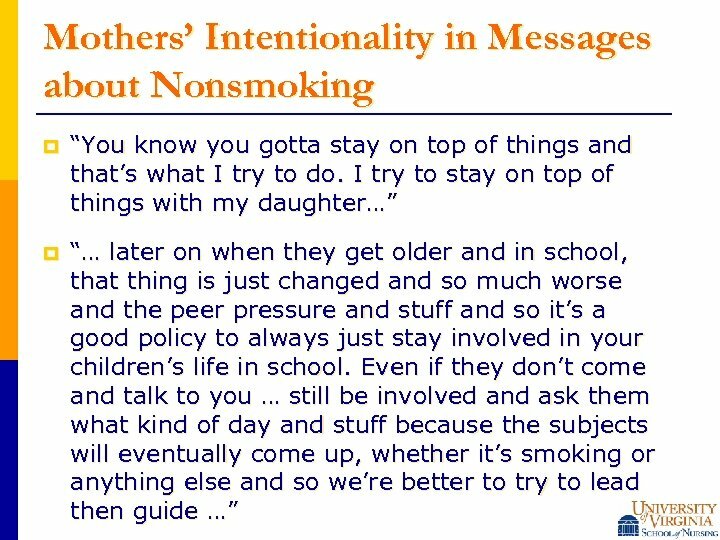 p Information, motivation, and support may be ways that parents help prevent youth tobacco use. p Parental ‘pride’ may be a factor that facilitates and reinforces open communications. 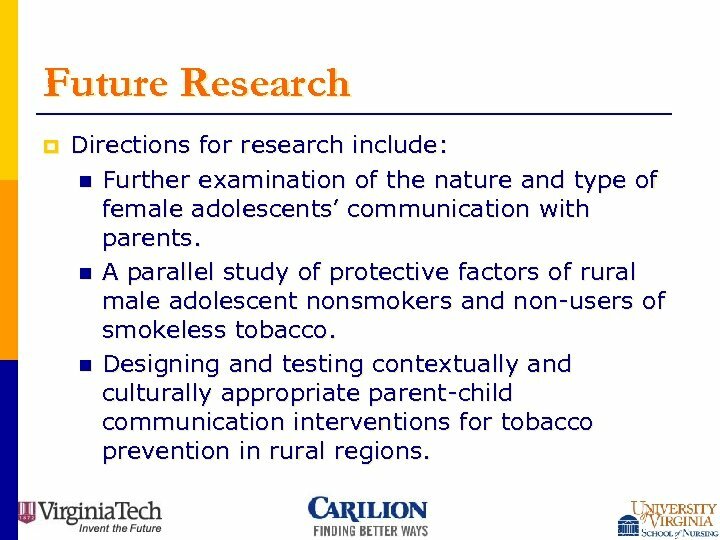 Future Research p Directions for research include: n Further examination of the nature and type of female adolescents’ communication with parents. 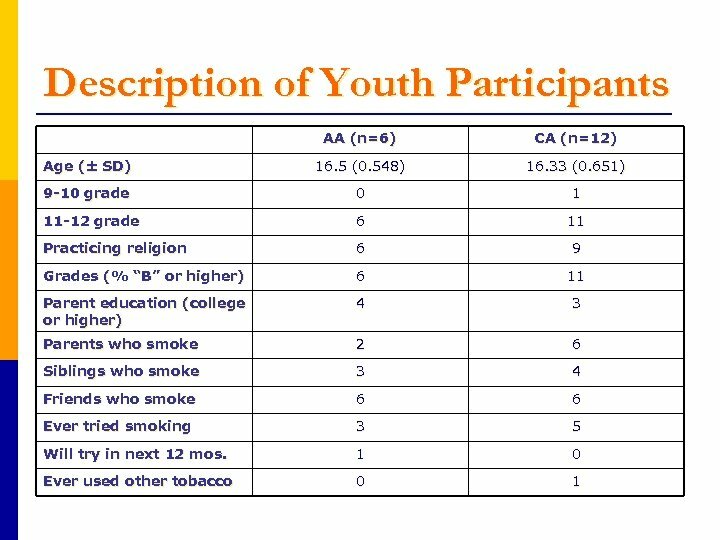 n A parallel study of protective factors of rural male adolescent nonsmokers and non-users of smokeless tobacco. 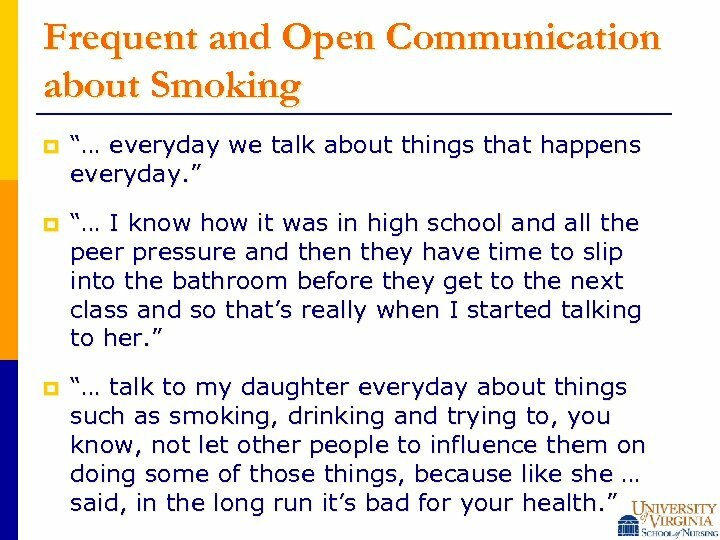 n Designing and testing contextually and culturally appropriate parent-child communication interventions for tobacco prevention in rural regions. References CDC. (2002 b). Cancer death rates-Appalachia, 1994 -1998. MMWR, 51 (24), 527 -529. CDC (2006). Youth risk behavior surveillance--- United States, 2005. Surveillance Summaries, MMWR, 55 (No. SS-5), 1 -108. Distefan, J. M. , Gilpin, E. A. , Choi, W. S. , & Pierce, J. P. (1998). 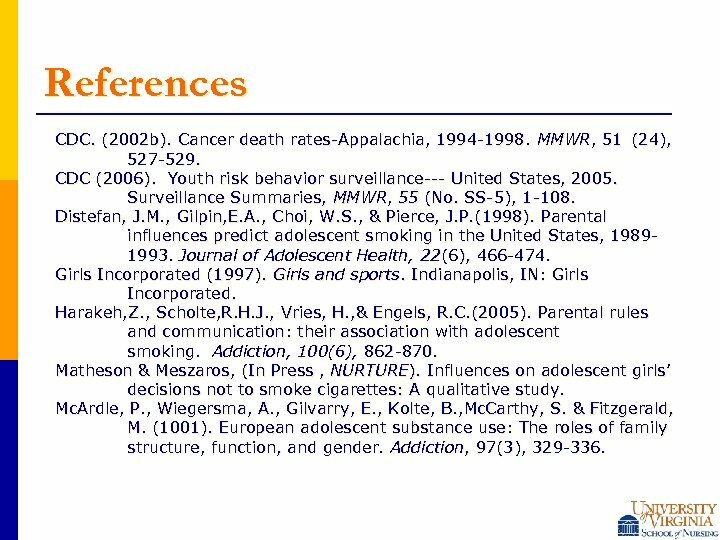 Parental influences predict adolescent smoking in the United States, 19891993. Journal of Adolescent Health, 22(6), 466 -474. Girls Incorporated (1997). Girls and sports. Indianapolis, IN: Girls Incorporated. Harakeh, Z. , Scholte, R. H. J. , Vries, H. , & Engels, R. C. (2005). 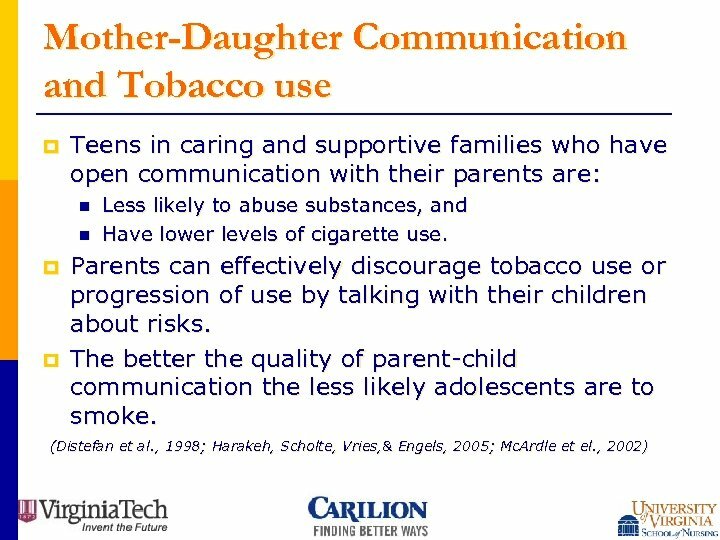 Parental rules and communication: their association with adolescent smoking. Addiction, 100(6), 862 -870. Matheson & Meszaros, (In Press , NURTURE). 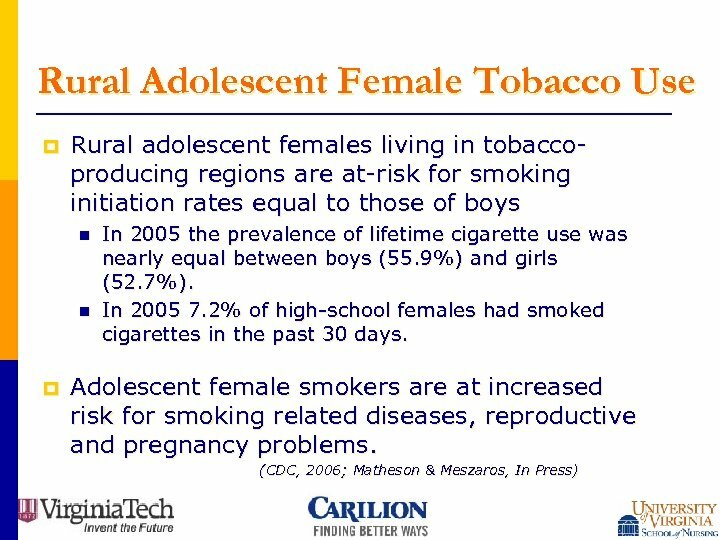 Influences on adolescent girls’ decisions not to smoke cigarettes: A qualitative study. Mc. Ardle, P. , Wiegersma, A. , Gilvarry, E. , Kolte, B. , Mc. Carthy, S. & Fitzgerald, M. (1001). 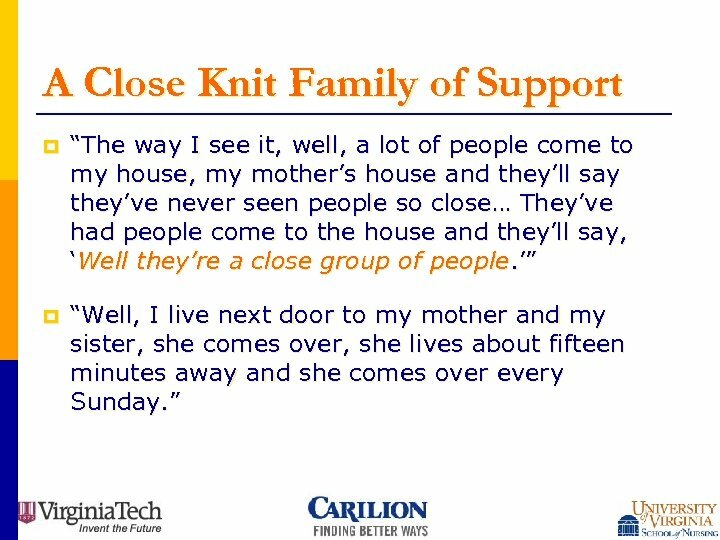 European adolescent substance use: The roles of family structure, function, and gender. Addiction, 97(3), 329 -336.